We have come a long way in our frame swap project. 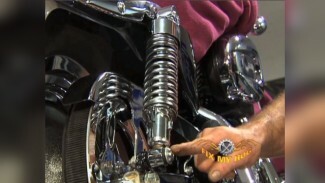 After completely stripping the bent Harley Softail frame, we cleaned, serviced or repaired all reusable components. We began our rebuild by getting our new Paughco frame into a rolling chassis configuration. This consisted of installing the swingarm, rear wheel, rear caliper assembly and rear shocks as a complete sub assembly. 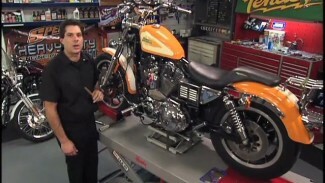 We temporarily used the original, damaged, Softail front end to support/roll the front of the motorcycle. This front end was, of course, temporary as we anticipated the delivery of a black powder coated Paughco Springer front fork assembly. Next, the motor and transmission were introduced to the frame and mounted together. Followed by the installation of the complete primary drive assembly and the starter. Oil tank, oil lines and main harness were to follow as well as exhaust and left and right side floorboard assemblies. With our oil tank, transmission and drive replenished with Spectro oils, we were anxious to install a new Mikuni carburetor and start Harley. We prefer to start this bike for the first time before installing our painted components and other incidentals. This way, it may be easier to make an unexpected repair if needed. It is also a way to try to avoid handling painted components more than need be. To start Harley without handlebar controls or a fuel tank, we simply plug our right side switches into the main harness and use a “Hot Bottle” as a fuel reservoir. 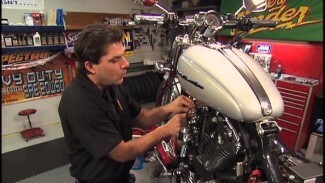 Fueling your motorcycle this way is safe when proper care is taken to use the remote bottle safely. Our Softail fires right up and comes to life. While running we check for exhaust or intake leaks. We verify that there are no unwelcome squeaks, ticks, knocks or other noises. We allow the m/c to come to temperature then get a good look around. We verify that there are no oil leaks. There is not much left before we have a completed motorcycle. After the bike’s owner makes a few last decisions, we will be able to wrap up and go for a test ride.